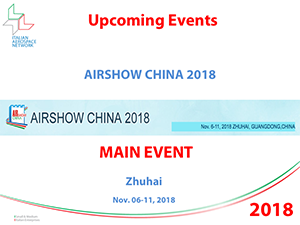 The Italian Aerospace Network (IAN) jointly with the China-Italy Chamber of Commerce (CICC) invites you to take part to the CHINA AIR SHOW 2018, which will take place from November 6th to 11th 2018. IAN & CICC has preliminarily booked an Italian Pavilion that will be dedicated to Italy and that will be shaped according to the final number of participants. Italian companies have a great chance to showcase themselves at the largest Chinese airshow. IAN & CICC Italian Pavilion will be furnished with a Welcome Desk, all-day-long refreshments, professional assistance and a wide range of services to fully accommodate the needs of the Italian companies. A nicely designed brochure will then be prepared and printed to present the participating companies. AIRSHOW CHINA 2018 is the only international aerospace trade show approved by the State Council that takes place biennially in Zhuhai. It features the display of real-size products, trade talks, technological exchange and flying display. Since 1996, the AIRSHOW CHINA has been successfully held for 10 sessions and has become one of the most famous airshows in the world. It is a gateway for international aviation and aerospace enterprises to showcase the latest technology and products in the fast-growing Chinese market.